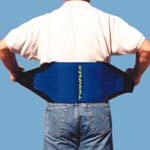 POSTURE CORRECTOR BACK BRACE - Provides support to the upper back and promotes popular posture. Inconspicuous under most clothing. White cotton canvas with two flexible stays.